i remember when my mom took me to get my ears pierced when i was 13. we went to one of those Piercing Pagoda kiosks in the shopping mall, and i was all butterflies and excitement and anticipation. we picked out a standard pair of small gold ball studs. the piercing was over in a prickly instant, and i actually looked forward to the nightly ritual of cleaning my new piercings. suddenly i felt a little more grown-up, and 14K real gold! real gold to be worn every day and always like a talisman. years later, i still love the same minimal jewelry – tiny diamond or gemstone stud earrings, a simple gold necklace. a few years ago, i began collecting delicate rings here and there from vintage shops and artisan designers. this season, i especially love this crescent diamond necklace, blanca monros gomez's black diamond ring, and these ear cuffs by Brvtvs. do you wear jewelry? what do you love? What a gorgeous photo from Tomboy Style, so right on as far as what I'm craving right now. I've actually always been more of a big piece kinda gal, big earrings, wacky necklaces, huge rings, but the past few years have seen me wearing almost no jewelry in a weird backlash to my earlier tendencies. Now I'm coveting some more special pieces, small and delicate but meaningful and thoughtfully crafted. Just the sort of thing you've got going on here. Love. i've gone through a similar thing, i used to wear bright and brash jewellery, but have been toning it down over the last couple of years or so. my favourite pieces now definitely can be incorporated into my day-to-day outfits, which makes me happy. My daily jewelry include a delicate chain bracelet with a zirconia stone, a skinny ring and some herkimer diamond earrings. So I know what you mean, minimal jewelry is the best and most elegant. Love those tiny diamond earrings! Hm, I've been wearing the same combination of daily jewelry for a few years now: two silver rings purchased in cuba on my left hand (always the same fingers. i may have lost one forever and am going through a slight identity crisis), one thin studded ring on my right ring finger that's a place holder until I find a proper replacement for another ring lost, a thin leather bracelet with clasp that a friend gave to me from her time abroad in Italy (another replacement of sorts. I feel too over the top wearing more than one thing on my wrists so this is taking place of my recently broken watch, and I plan on wearing it every day till it gives out as well, lol). I've got a strange amount of personal "rules" when it comes to jewelry that dictate the other, less daily pieces i wear (earrings, necklaces), but no matter what, you'll see those pieces on me everyday regardless of the occasion. 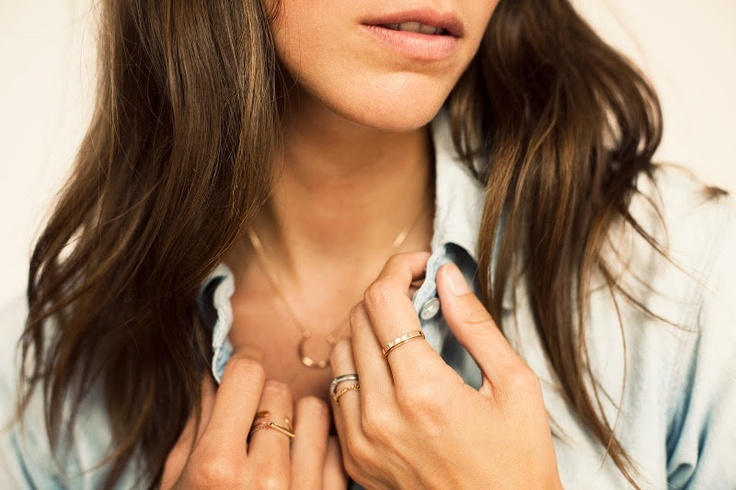 I love when people wear the same jewelry all the time - it becomes a part of them to the point where they're partially characterized by their accessories! I like that smaller pieces can be so understated and also a little anonymous. I spent a couple of years wearing a small silver cross every day - there was no need to take it off. It just blended and became part of me. But one day I took it off and lost it. I tried to replace it with another one but it just didn't feel the same. Nowadays, I only wear something when I feel a little too "naked" around the neckline. yes, exactly! maybe you could find a tiny gold cross to replace your lost one? I love to layer silver necklaces, preferably three or four at the time, although I am known to break out a chunky and sparkly statement necklace when the mood strikes. I do own some yellow gold jewelry, but it just feels wrong somehow when I wear it. I am much more a silver/white gold kind of gal! I have been wearing a single wooden spiral stretcher in my right ear for 4 years now. I also have a silver and turquoise pendant worn around my neck on a silver chain. It was a gift from my grandparents who spent a lot of time travelling through South America (the necklace is from Peru). I've been wearing it without fail since I was 10.
love the story behind your necklace :) what a special piece! i agree - this is why i love buying vintage! I look better in BIG rings or necklaces. And small, simple earrings, pearl or CZ studs. If I'm feeling fancy one of my art deco chandelier earrings. I haven't been wearing my studs lately, since I lost one of my pearls, and I was sharing the earring backs between the 2 sets. Eventually I'd like to get some "flat" (bands) rings to wear on my left hand. i've seen earring backs (14k gold) for sale that are pretty inexpensive. i remember your jewelry post - what a great collection of statement pieces! Well, you know my love of delicate gold jewelry. My favourite piece of jewelry is a pair of diamond and gold star studs - my grandparents had them made for my mother when she was a newborn. I wear them constantly. These days I am alternating my delicate gold pieces with a few big ethnic pieces - usually made of wood, bamboo or amber. I had two ikat dresses made earlier in the year by White Champa and somehow wood jewelry feels just right with these dresses. I find bracelets and necklaces really distracting so I keep it pretty simple. I have lots of steel rings in my ears from my punk days which are always there. I have a victorian yellow gold and diamond ring on my left hand, passed down from my grandmother. On my right hand I always wear a silver ring - either a little mother of pearl one or a chunky turquoise one, both from little shops in Cornwall. And my gold Skagen watch! When I go out in the evening I usually put on a big 'bib'-style necklace - I love the look of a chunky metal necklace under a silk blouse. i rarely wear bracelets during the week. my rose gold skagen watch has been my fave for 3 years running now. i also love a chunky bib necklace for nights out/occasions. just enough 'bling' to go with a simple outfit. I prefer delicate jewelry over statement pieces by far. I have several pieces of sterling silver, and am slowly building a collection of gold. My husband just surprised me with some 14k gold earrings I've been wanting as a gift, so now all I need is a gold necklace. i really love BMG's fine gold necklaces. such an understated, minimalist aesthetic. I went through a chunky necklace phase in my 20s, but now I stick to "uniform" jewelry that I wear day in, day out - a pair of small steel hoops from Charriol, a sterling silver necklace with a teeny seahorse pendant from Thomas Sabo, and a steel watch from Nixon, which I like to call my robot watch. Each piece has a story, and even worn together, everything is very understated. I'm looking into building the gold version of this set next. ooh lucky you! i always love a bit of turquoise with gold, especially for summer. I love simple gold jewelry. But I have a tendency to not wear them out of fear of losing them and just plain forgetting to put them on. I thought about investing in a watch so I can have that process after getting dressing to put on accessories. Back in my younger days I was obsessed with earrings but now I'm more of a ring and bracelet fan. Although that three cuff earring is really calling my name! I love delicate gold and diamond jewelry. I think I've inherited a bit of my mom's exquisite taste for fine jewelry. I wear earrings every day, but I only wear studs. I don't look right in anything else. Most of my pieces are quite special to me. They were gifts to commemorate special events, pieces that were commissioned by a jeweler my family works with or were given to me by loved ones. I also love picking up pieces while traveling. With a collection of very serious pieces, I do like to throw in the fun statement piece (a Chanel necklace here or there) from time to time. I LOVE looking at statement necklaces but for the life of me, can't carry off the look without looking like a blinged out rapper. I used to wear a few teeny tiny diamond pieces (nothing big. Can't afford them!) which are gifts from my mom and hubby. However, I had to take them off, put them back etc etc so I just don't bother now.